It certainly would be silly to get an over-the-counter painkiller on prescription unless you need large supplies for a chronic condition. However, what raised my 'failure to understand numbers' antennae was the bit that says 'it actually costs the taxpayer and NHS about £10'. Now it's certainly true that the price of a prescription to the patient in the UK (unless they qualify for free ones) is £8.40. 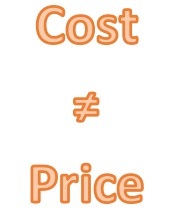 But price and cost are not the same thing. When you buy something in a shop, the price is the amount you pay - the cost is what the shopkeeper (or in this case, indirectly, the NHS) pays. In the case of paracetamol, it is going to be a fraction of the price. Prescriptions have an unusual pricing model, in that the price to the consumer is fixed, whatever the cost to the NHS. So the cost might be 10p for those painkillers or £10,000 for some leading-edge treatment: you still pay the same £8.40, or nothing at all if you get prescriptions free. Of course, it's a bit more complicated than that, with both bulk discounts and the cost to the NHS of dispensing a prescription (though the incremental difference of the cost of a single prescription is likely to be pretty small). However, the main thing is to remember is that just because a packet of paracetamols would be priced at £8.40 if you bought them as a prescription - making it more sensible to buy them off the shelf - and you will save the NHS some money if you buy them yourself instead of using a free prescription - this doesn't mean that your get them free costs the NHS £8.40.